Beef Stir Fry – this stir fry recipe is loaded with tender pieces of beef tossed in a savory and mouthwatering stir fry sauce. This quick and easy to make beef stir fry recipe is so much better than takeout! This easy beef stir fry is the perfect quick meal to serve during busy weeknights. 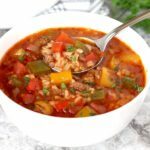 Bursting with flavor, this amazing restaurant quality meal is one my family requests all the time. We love serving it with white rice and steamed vegetables. 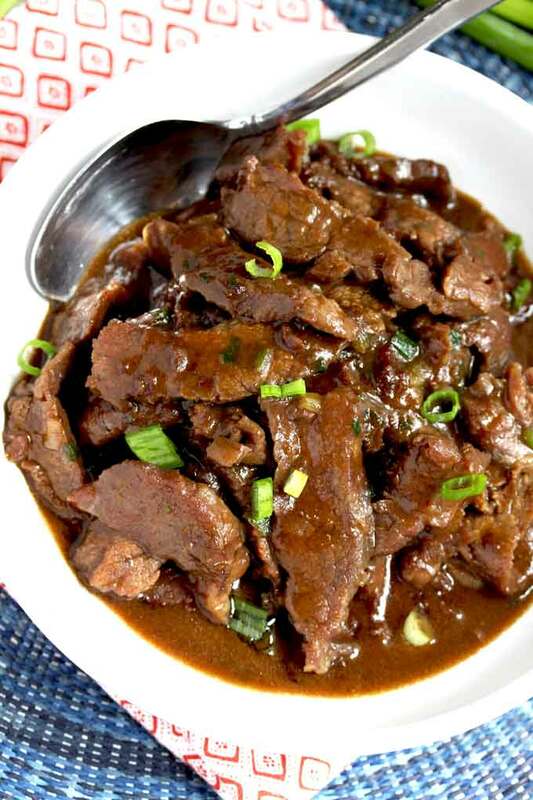 What Is The Best Beef Cut To Use For Beef Stir Fry? My favorite cut of beef for stir fry is flank steak. Slice the steak thinly against the grain (cut it across the lines that run along the length of the beef). You can also use skirt steak and sirloin steak. More expensive cuts of steak like rib eye and strip steak work well also. They cook quickly and are melt in your mouth tender. 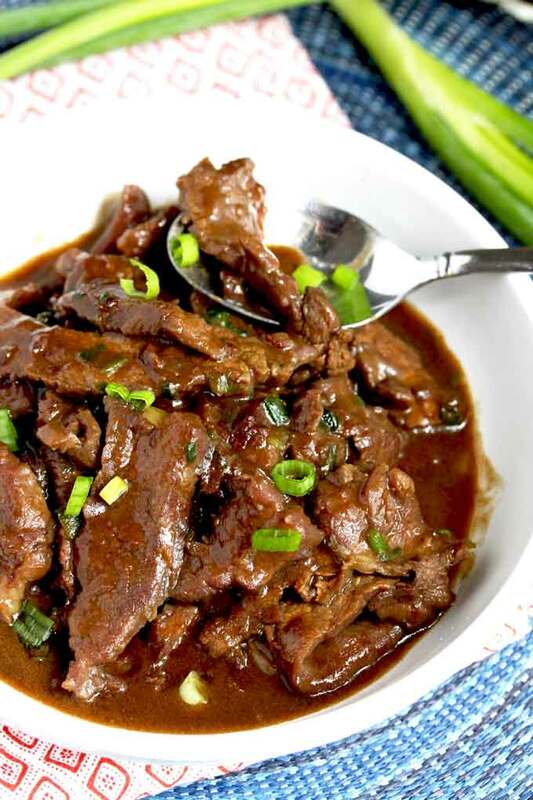 How To Make Stir Fry Beef Tender? The secret to extra tender melt in your mouth beef is in the marinade! 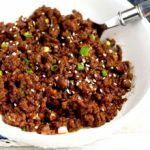 While the soy sauce and sesame oil add lots of flavor, the baking soda tenderizes the beef and keeps it juicy when cooked. Did You Know? Baking Soda raises the pH (alkalizes) the meat’s surface, making it difficult for the proteins to bond in excess. The alkalization keeps the meat juicy and tender when cooked. The sauce is really one of the most important parts of this dish as it imparts amazing and perfectly balanced flavor to the dish. Before adding the sauce to the stir fry, make sure you give it a quick whisk as the cornstarch tends to set at the bottom in no time! Make The Marinade: This easy marinade not only adds amazing flavor to the beef but also tenderizes it. Marinate the beef for a minimum of 15 minutes and as long as 4 hours. Prep the Beef and Aromatics: Slice the beef, slice the scallions, mince the garlic and ginger. Make the Stir Fry Sauce: Combine the stir fry sauce ingredients. Time to Stir Fry: Cook the beef in a hot wok or skillet coated with oil. Toss and cook until lightly brown but not completely cooked through. Make room in the middle of the wok and add the garlic and ginger. Cook for about a minute. Add the sauce to the wok and cook stirring constantly for about a minute or until the sauce thickens. Instead of flank steak, use chicken, shrimp or pork. Add vegetables like snap peas, sliced bell peppers, asparagus, mushrooms, sliced carrots, onions, bean sprouts and baby corn. Add 2 tablespoons of sugar for a sweeter tasting sauce. Add red pepper flakes or Chili oil for a spicy stir fry! Have your meat marinated and your sauce ready before you start cooking. If you marinate the meat in the refrigerator, let the meat come to room temperature before cooking it. Make sure your wok or skillet is smoking hot before stir frying. If adding vegetables, make sure they are cut into bite size pieces. Check these other restaurant quality Chinese recipes Orange Chicken (light and healthy version) and our favorite easy to make Beef with Broccoli! 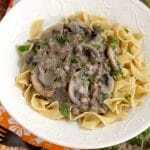 WANT TO TRY THIS EASY RECIPE? PIN IT TO YOUR DINNER OR ASIAN FOOD BOARD TO MAKE IT LATER!! 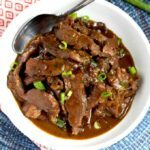 Beef Stir Fry - this stir fry recipe is loaded with tender pieces of beef tossed in a savory and mouthwatering stir fry sauce. 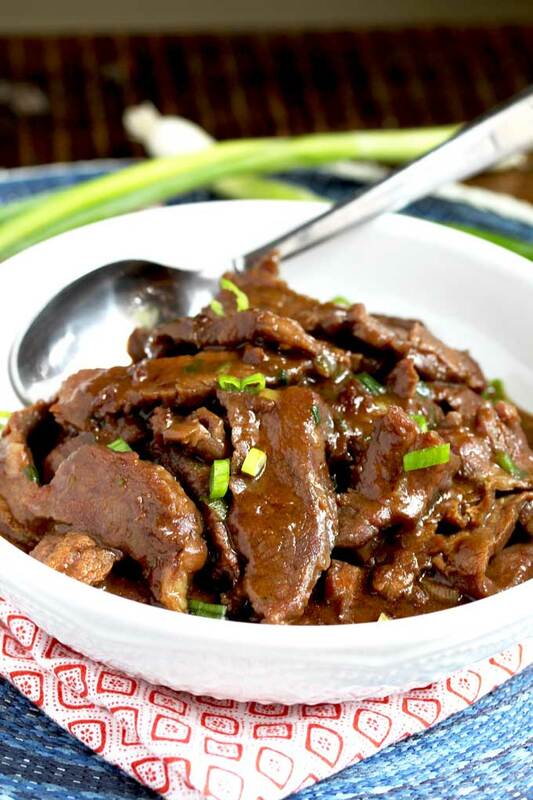 This quick and easy to make beef stir fry recipe is so much better than takeout! Whisk the soy sauce, sesame oil, cornstarch and the baking soda in a medium bowl (or you can mix the ingredients in a large zip top bag for easy clean up). Slice the beef into thin strips and add them to the marinade. 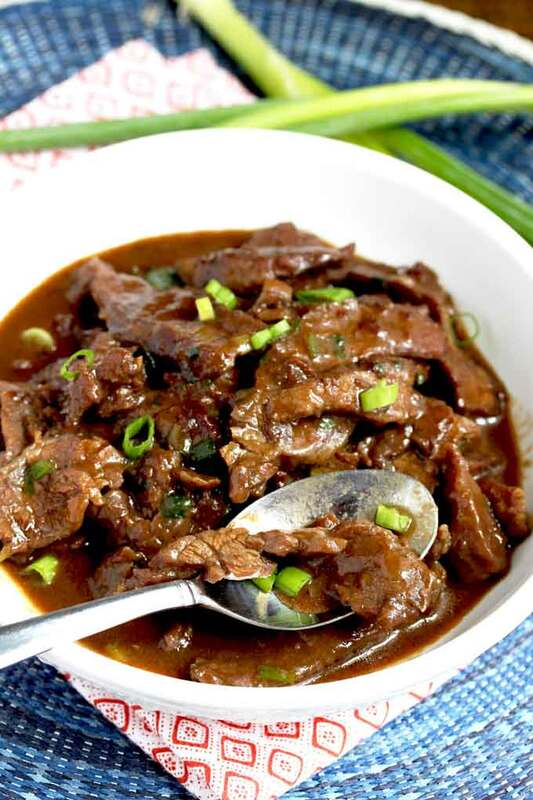 Let the beef marinate over the counter for 15 minutes or in the refrigerator for up to 8 hours. In a small bowl, stir together the soy sauce, rice wine, stock, oyster sauce, sesame oil and cornstarch. Mix until well combine. In a wok or large skillet heat the oil over high heat. Add half of the beef, spreading it out in a single layer. Cook for about a minute until lightly browned on the first side, Toss and continue to cook, stirring frequently for about 1 minute. The beef will not be cooked through at this point. Remove the beef from the wok and into a bowl and set aside. Pour the remaining oil into the skillet and cook the remaining beef. Return the beef to the wok and make some room in the middle of the wok. Add the garlic and ginger, Cook for about a minute stirring the garlic and ginger. Toss to combine. Add the sauce to the wok and cook stirring constantly for about a minute or until the sauce thickens. Stir in the scallions and serve. forget takeout… this was way better than what I get at our local takeout place… the meat especially was so tender…. And in all honesty it came together so fast it was on the table faster than ordering and going to pick it up. Who knew that life could be that easy! We agree! It is way better and cheaper than take-out! We loved this recipe. Super easy and so fast!! And without all the nasties that are in take out food. Definitely a keeper. Homemade is always so much healthier! Thanks! What a great recipe!! I served with white rice and I wish I double or triple the recipe so I can take to work for lunch! Just DELICIOUS! Followed as written, but doubled to feed my hungry family of five and everybody enjoyed it!